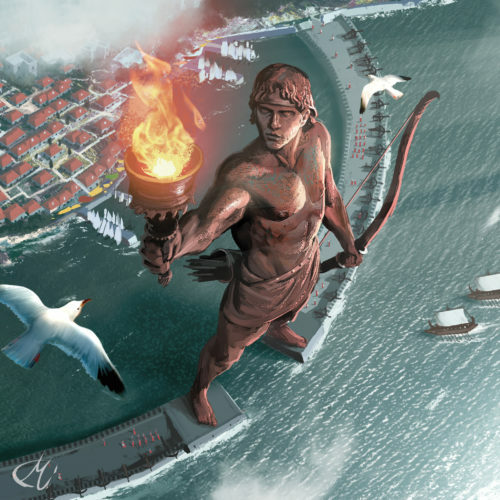 7 Wonders is one of the most successful games of 2011. 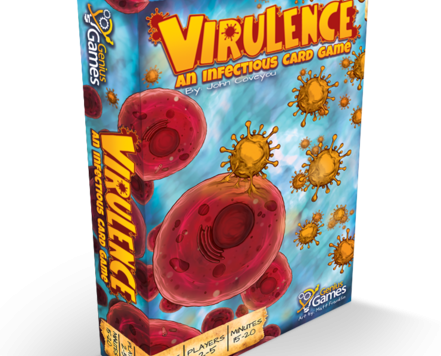 It has won numerous awards and captured the hearts of board game lovers at the same time. 7 Wonders is a game of deep strategy although that may not be apparent to anyone who just played a couple of games. The more you play it, the more you will appreciate its depth and try to think of the best strategies to win. As this is a draft card game, a solid strategy that will always guarantee the win doesn't exist. One must always pay close attention to what his/her neighbor strategy is and adjust accordingly. However some general strategy tips always apply and can help a lot to improve your game. This is what the current strategy guide is about. Moreover we will discuss the different cities available in the game and the best approach to win with each of them. This guide will assume your are aware of all game components as well as the game mechanics. Main strategy: Scientific structures (green cards) supplementary: Military structures (red cards) or Civilian structures (blue cards). A risky but ,if successful, very rewarding strategy. You must start gathering scientific symbols as soon as you can, even from Age I. If you are the only one on this path it's a guaranteed win. The scientific cards earn victory points in two very different ways : from sets of identical symbols and from sets of 3 different symbols. The victory points earned by both methods are cumulative. It's better to focus on collecting sets of the 3 different symbols as a main goal and sets of identical symbols as a secondary goal. Deciding on a strategy sometimes is relevant to the city you lead, as particular stages of your wonder may promote a specific strategy. We will later examine each city and the ideal strategy you could use for each. During the first Age you should be able to at least build the first stage of your wonder, so you should draft cards that at least provide these two resources. It would be wise, however, if you began to plan for your future needs as well. Best cards to pick are multiple resource cards like Tree Farm, Excavation e.t.c. 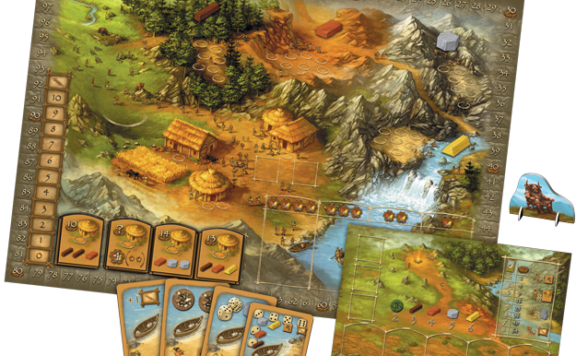 Alternatively you could rely on commerce, if your neighbors have the resources you need, and invest in yellow "Commerce" cards like East Trading Post (allows you to buy one of the basic goods from the neighbor on your right), West Trading Post (allows you to buy one of the basic goods from the neighbor on your left) and Marketplace (allows you to buy one of the manufactured goods from both left and right neighbors). An interesting strategy here is to observe your neighbors resources and pick goods they don't have. That will force them to trade with you, giving you some extra income and impede their progress. If you plan to take the "scientific" path, you better start early and pick one or two green cards in Age I. If you plan to be military aggressive take one red card to get an early head start in battles. Preferably build the first stage of your wonder during the last few rounds of Age I. In Age II first go for the goods that you are missing in order to build the next stages of your wonder. If your neighbors have something you need, then you should buy it from them, don't bother to buy the corresponding resource card and focus on your main strategy, unless of course you are in the "resource gathering" path. Remember that this is your last chance to gain resources as there are no brown or gray cards in Age III. If you go for Military power, make sure you always have more shields than your neighbors. At this stage, you should pay close attention to your neighbors strategy and try to block them. For example if you are passing cards to someone gathering green cards, avoid to give them a green card that will give him a set of three different symbols or 3 or 4 of a kind. If you are not on the "scientific" path then use the card to build your wonder or discard it to get coins. Age III cards are pretty expensive therefore you will need coins during the third Age. To decide which is the best card to keep, always calculate the benefits you will get in victory points by choosing each card as well the benefit your neighbor will get from the cards you will pass him. Choosing the card that suits your strategy, which is the obvious choice, isn't always the best one if you are going to pass your neighbor a card that will give him a lot more points than you get. This decision also depends on how much ahead in points your neighbour is, which isn't always easy to calculate and things can change drastically in Age III during which players get the most points. However don't overdo it by focusing on blocking your opponents because this way you may neglect your own strategy and give the chance to win to a "distant" neighbor. At the end of Age II you should, most times, have build the second stage of your wonder or even the third one too. Building the last stage of your wonder in Age II gives you the ability to use 1 more card from Age III which can be essential since the last age is full of important cards you wouldn't want to miss in order to build your wonder. This is the most important Age of all as you will score the most victory points during it. Resource cards (brown and gray) are absent but a new kind of card makes its first appearance here, "Guild" cards (purple). Guild cards can score big points, taking advantage of your neighbors strategy. For example if both of your neighbors have invested in the "scientific" path, pick the "Philosophers Guild" (which grants you one victory point for each green card of your left and right neighbor) and score big. If you are on the "resource gathering' path, always go for the "Shipowners Guild" (grants one victory point for each brown, gray and purple card you own). If on the "scientific" path, "Scientists Guild" will prove valuable (at the end of the game, grants you a scientific symbol of your choice). Extra caution on your opponents strategy applies here too. Now let's take a closest look at each of the 7 available cities: Rhodes, Alexandria, Ephesus, Babylon, Olympia, Halicarnassus and Giza. On side A of each of these cities the first and the last stage of the Wonder is the same: the first grants 3 victory points and the last 7 victory points. B sides are more complex. Both sides of the Colossus favor the Military path as it grants 2 shields upon completion of second stage (side A) or 1 shield per stage (side B). Complimentary to that you could ideally go for Civilian structures (blue cards) or Guilds or a combination of the three. Be careful to gather all resources needed for your wonder because you need several copies of each resource. Alternatively, you can change the rules of commerce by building Trading Posts. Both sides of the Lighthouse grant extra resources which makes the city ideal for the "resource hungry" civilian strategy (Blue cards supplemented by red ones). Build the first two stages as soon as you can, in order to use their benefits. Both sides of Ephesus grant you victory points as well as coins. That means that you could easily rely on commerce to get the materials you need and not focus so much on resource gathering. That leaves you enough space to go for the "scientific" path (green cards), supplemented by either Civilian or Military structures. On side A, upon building the second stage of the wonder, you are granted an extra scientific symbol of your choice at the end of the game. On side B the same applies for the third stage of the wonder, while the second stage gives you the option to play your seventh Age card instead of discarding it. This city is one of the most straightforward regarding the strategy to adopt. The "scientific" path is the favorable choice and you should try to build the second stage of the wonder at the end of Age I. Remember that you can build the second stage on the sixth turn, which will allow you to immediately play your seventh card. In Olympia, Side A, gives you the option to build a structure for free, once per Age. You should build the second stage of your wonder as soon as possible to reap the benefit. Playing with side B, the first stage allows you to purchase raw materials [Stone,Clay, Wood, Ore] from your two neighboring cities for the price of one coin instead of two. The third stage allows you to “copy” a Guild (purple card) of your choice built by one of your two neighboring cities. Build the first stage as soon as possible and avoid to buy any trading posts in Age I as you will be given a dual trading post for free when you build the first stage. In general, Olympia makes it easier for you to build structures either by allowing you to play one for free either by giving you easier access to materials. You could easily opt for any strategy here but I recommend the "Civilian" path, mainly because blue cards are the most demanding in resources. The "Resource gathering" path, mainly because of the high cost of the wonder's stages and because blue cards are the most demanding in resources. You will have to gather resources for blue cards as well as your wonder, which requires 3-of-a-kind materials so expect to pick up many brown/gray cards. The scientific path. Starting out with textile, gives you the opportunity to grab easily your first green card which is Apothecary. Go for every green card possible, gather some materials (preferably all of the manufactured goods plus materials needed for your wonder) and possibly some yellow cards that will make commerce easier for you. Go for military or civilian as a supplementary strategy. Giza has no special abilities granted by its wonder. That leaves the player free to decide on his/her strategy. However the high cost required to build each stage of the wonder favours the "resource gathering" path. You will have to gather resources for blue cards as well as your wonder, which requires 3 or 4-of-a-kind materials so expect to pick up many brown/gray cards. Don't rely on Commercial structures (yellow cards) in order to exploit better Haven and Traders Guild. I hope this guide will help everyone to improve their win percentage in 7 Wonders. The game allows for creativity and flexibility so feel free to comment and post your own strategy tips. Happy drafting! Like this game? Buy it now from Amazon.com! This item ships for FREE inside U.S.A. with Super Saver Shipping. Maria is an avid board gamer, interested also in video games, movies and tennis. She is also an accomplished surveying engineer and a proud mum.